Eric Wolff at Politico reports that FERC bars the door. RTO Insider reports that Protesters Force FERC to Close Monthly Meeting. SNL Financial LC writes about the #RubberStampRebellion, mostly from the viewpoint of FERC Commissioner Tony Clark, in an article called ‘Respond to incivility with civility’: FERC commissioner endures protest at home. Politico mentions the #RubberStampRebellion protests in front of the homes of FERC commissioners. The Washington Examiner reports that Feds take steps to block anti-fracking activists. StateImpact writes about the #RubberStampRebellion. Popular Resistance picked up our blog post about Day 1. BXE’s delicious #PancakesNotPipelines action at FERC is getting much coverage, including at EcoWatch, Popular Resistance, Tim DeChristopher’s website, Earth First!, AlterNet, DeSmog Blog, and Politico (scroll to item “MMMM … pancakes”). Video by Eleanor Goldfield at ArtKillingApathy here and by RT America here. The word ‘networks’ in the sixth paragraph has a hyperlink to BXE’s website. The article also quotes Greg Yost of BXE and Patrick Robbins with BXE ally Sane Energy Project. Activists quoted throughout do a commendable job knocking away the “bridge fuel” argument. “Activist group plans ‘rebellion against FERC’ for fossil fuel work,” by Sean Sullivan in SNL. From the article: The decision was a rare win for environmentalists like Beyond Extreme Energy and the Sierra Club, who say FERC has acted as a “rubber stamp” for natural gas exports. Meet the People Making Life a Little More Difficult for FERC this Week, by Michael Brooks in RTO Insider. U.S. natural gas projects face Keystone-like resistance, By Bill Loveless in USA Today. Another Meeting Day, Another Drama at FERC, By Rich Heidorn Jr. in RTO Insider. 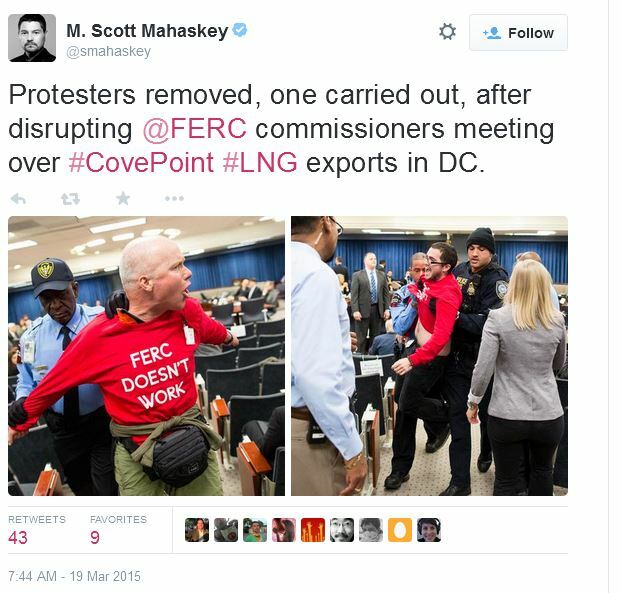 Dozens Denied Access to FERC Public Meeting, by Anne Meador and John Zangas at DC Media Group. Planned protests change FERC meeting schedule, in Argus. 1on1: Earth Day – Man Who Did “Great March for Climate Action”,interview with Lee Stewart. Clearing the FOG speaks with activists from Washington State to Washington, DC who are taking on Big Energy to say “no” to more fossil fuel infrastructure. The Recorder is the newspaper of record serving Bath and Highland counties in Virginia. Fracked gas opponents are increasingly effective in their opposition to new gas pipelines. BXE is mentioned in the article. Mouthing off? Wait until the last week of May, folks. You ain’t seen nuthin’ yet. Thursday morning, March 19, singing and chanting members of We Are Cove Point (WACP) from Lusby and their supporters from Beyond Energy (BXE) attempted to sit in and read a statement at the Federal Energy Regulatory Commission’s(FERC) monthly meeting, protesting FERC’s failure to rule on a Request for Rehearing of its Sept. 29, 2014 order approving Dominion Resource’s construction permit for Cove Point. After repeated protests at their regular monthly meetings, the commissioners of FERC adopt a rule that such actions are not allowed and won’t be considered in the official record.